BRAND NEW PRODUCT ALERT!!!! IF YOU LIKE MY BASEBALL AND FOOTBALL GAMES THEN YOU WILL LOVE THIS JUST AS MUCH! This game has been a game changer in my classroom! Seriously, my students can't get enough! I have finally found the perfect way to practice math facts, get my students up and moving and have a blast at the same time! My students BEG me to play this. I am actually using it as a classroom reward if they behave for the day, they get to play the game. Little do they know how much they are learning. The game is easy to display on your smartboard, promethean, screen or whiteboard. 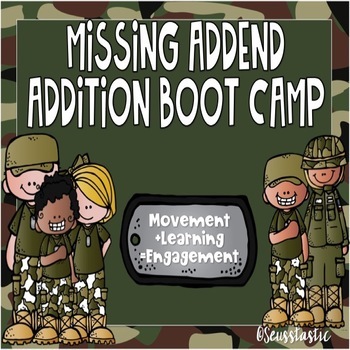 I have provided all the rules, implementation ideas, tech tips, 90+ missing addend addition boot camp fact slides, classroom layout and set-up directions + so much more. I haven't been this excited about a product in a LONG time! 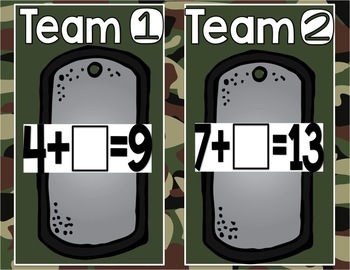 *Divide class into 2 teams (girls against boys, tables against tables, pick a team captain and have them choose their own teams, pick sticks, or do a 1-2 count off). *Go to the designated starting slide & follow directions to put the PDF into "full screen mode". *Advance screen using your arrow keys or use a presentation clicker. *Drill Sergeant yells "REPORT FOR DUTY" & two students in line come up to the screen. Whoever gets the answer correct stays in the game. The other player is out. 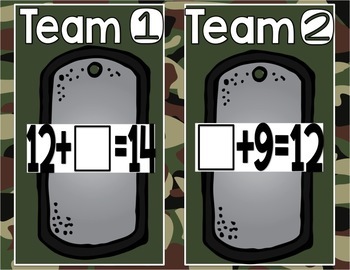 If the players tie, keep going until one player answers first. 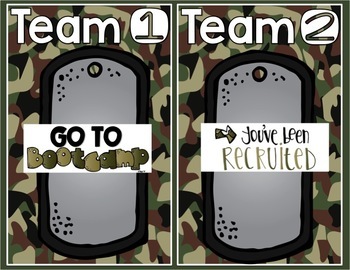 *OORAH/THERE'S NO CRYING IN BOOT CAMP slide: OORAH=Stays in game & chooses player to come back into the game. THERE'S NO CRYING IN BOOT CAMP=Player is out. *The team who still has players wins the game. Just like my Candy Land games, I will make many more BASEBALL, FOOTBALL, & BOOT CAMP games that follow K-3 curriculum. Stay tuned for a TON more games! Check out my ELA BUNDLES! Check out my Journey's Unit One Baseball Game HERE! Check out my Journey's Unit Two Baseball Game HERE! Check out my Journey's Unit Three Baseball Game HERE! Check out my Journey's Unit Four Baseball Game HERE! Check out my Journey's Unit Five Baseball Game HERE! Check out my Journey's Unit Six Baseball Game HERE! Check out my Candy Land Journey's BUNDLE HERE! Check out my Parts of Speech Baseball Game HERE! Check out my SOUND Baseball Game HERE! Check out my Long A (Sneaky e) Baseball Game HERE! Check out my Long EE/EA Baseball Game HERE! Check out my Long I (Sneaky e) Baseball Game HERE! Check out my Long O (Sneaky e) Baseball Game HERE! Check out my Long U (Sneaky e) Baseball Game HERE! Check out my Long Vowel (Sneaky E) Baseball Game HERE! Check out my Dolch Sight Word Baseball Game Here! Check out my Sight Word Baseball Game (Fry's 1st 100 Sight Words )HERE! Check out my Sight Word Baseball Game (Fry's 2nd 100 Sight Words) HERE! Check out my Sight Word Baseball Game (Fry's 3rd 100 Sight Words) HERE! Check out my Sight Word Baseball Game (Fry's 4th 100 Sight Words) HERE! Check out my Short Vowel Baseball Game HERE! Check out my Blend & Digraph Baseball Game HERE! If you are looking for an easier multiplication game, check out my multiplication baseball game (facts to 5) here. If you are looking for an easier addition game check out my addition facts to 10 baseball game here. If you are looking for an easier subtraction game, check out my subtraction baseball game (minuends to 9) here.